a) Give PEAS description for an Autonomous Mars Rover. Characterize its environment. b) Give the initial state, goal test, successor function, and cost function for the following problem "You have to colour a planar map using only 4 colours, in such a way that non two adjacent regions have the same colour". c) Draw and explain architecture of Expert System. d) Explain Hill-climbing algorithm with an example. 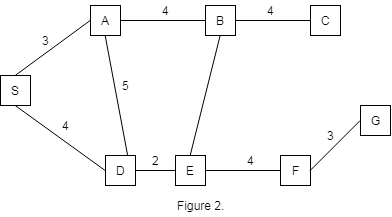 2(a) Explain decision tree learning with an example. i) Horses, cows, and pigs are mammals. ii) Bluebird is a horse. iii) Whoever can read is literate. iv) Every tree in which any aquatic bird sleeps is beside some lake. v) Anything anyone eats and is not killed by is food. 3(a) Design a planning agent for a Blocks World problem. Assume suitable initial state and final state for the problem. 3(b) Consider a situation in which we want to reason about the relationship between smoking and lung cancer. Intuitively, we know that whether or not a person has cancer is directly influenced by whether she is exposed to second-hand smoke and whether she smokes. Both these things are affected by whether her parents smoke. Cancer reduces a person's life expectancy. i) Draw the Bayesian network. ii) How many independent values are required to specify all the conditional probability tables (CPTs) for your network? 4(a) Compare Greedy Best first search and A* search algorithms based on performance measure with justification: Complete, Optimal, Time and Space complexity. 4(b) Write a pseudo code for alpha-beta algorithm. Apply alpha-beta pruning on example given in Figure 1 considering first node as max. 5(a) Define the terms chromosome, fitness function, crossover and mutation as used in Genetic algorithms. Explain how Genetic algorithms work? 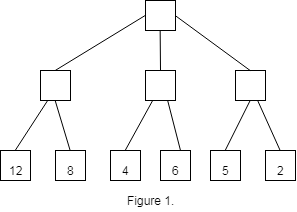 At each step of the search algorithm, show which node is being expanded, and the content of fringe. Also report the eventual solution found by the algorithm, and the solution cost. Assuming the straight-line distance as the heuristics function: h(S)=10.5, h(A)=10, h(B)=6, h(C)=4, h(D)=8, h(E)=6.5, h(F)=3, h(G)=0. i) What are steps involved in natural language processing (NLP) of an English sentence? Explain with an example sentence. ii) Draw and explain the basic building blocks of Learning Agent. iii) How will you convert the propositional logic statement into CNF? Give a suitable example at each step.